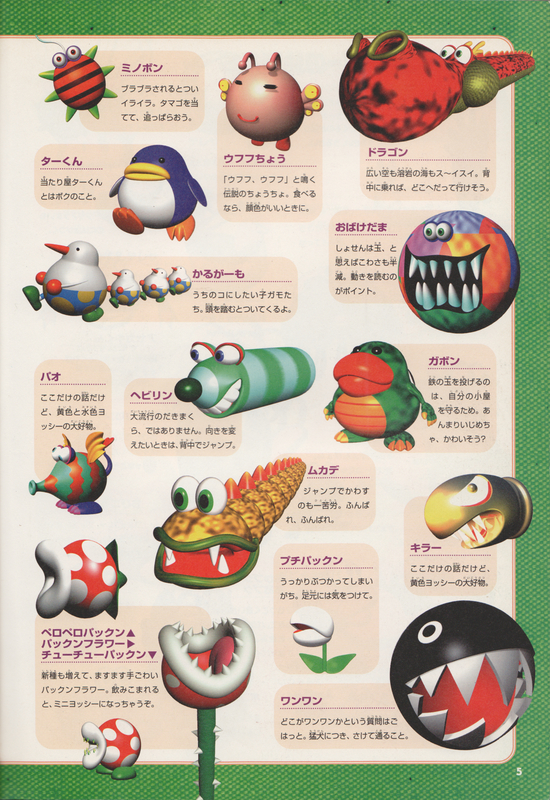 This article is about the variety of Chain Chomp. For other uses of the word "Chomp", see Chomp (disambiguation). A Chomp from Yoshi's Story. Chomps are chainless Chain Chomps. They are much bigger than normal Chain Chomps, setting the standard for their huge sizes. Definitive Chomps make their debut in Super Mario World 2: Yoshi's Island, but only through variations, such as the leaping Incoming Chomp and terrain-eating Chomp Shark. These variations, as well as a few others, continue to appear throughout later Yoshi's Island games. In Yoshi's Story, they only appear in Jungle Hut, World 4-1, where the Baby Yoshis must avoid three of these enemies to collect certain fruit within one of the huts. They are enormous, being one of the largest enemies in the game, and constantly move left-to-right, chomping as they move. Each appear on a different vertical level of the hut. Unnamed Chomp-like creatures appear in Super Mario Kart's Match Race, where they act as additional obstacles, though only on certain tracks. They bounce back and forth between two walls, and racers that come into contact with them will spin out and cause this creature to be removed from the race. If these creatures are intended to be Chomps, this marks their first appearance overall. 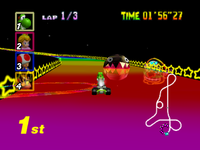 Definitive non-derivative Chomps make their Mario Kart debut in Mario Kart 64's Rainbow Road, serving as obstacles as they roam up and down the track. If a racer hits a Chomp, they will be launched into the air as if they hit a Fake Item Box. The Chomp on Chain Chomp Wheel. 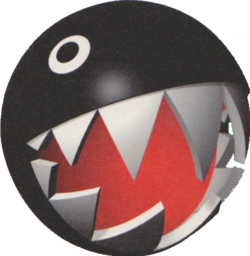 A Chomp also appears as a stage hazard in Chain Chomp Wheel in Mario Kart Wii. After being shot out of a cannon at the beginning of the battle, it rolls around in the mid section of the roulette wheel, and squishes any racers who it runs into it. It looks exactly the same as the Chomps in Super Mario Galaxy. They also appeared in the May 2nd 2009 tournament. Chomps also appear on Mario Kart 7's Rainbow Road. They appear on the moon portion of the track, rolling around the area. Players who run into a Chomp are knocked back and, like with every other hazard in the game, lose coins. Chomps also appear in Mario Kart 8 and Mario Kart 8 Deluxe in N64 Rainbow Road. This time, they bounce on the circuit, creating shock waves which racers can use to perform tricks. Racers who drive into a Chomp will get knocked back and lose three coins. In Mario & Luigi: Partners in Time, just as the four heroes are heading through the Warp Pipe to get to the top of the Princess Shroob statue in Shroob Castle, a Chomp leaps out of the basement's sewer water and bashes the pipe, redirecting its destination to the basement. Later, as the brothers are about to hit an Exclamation Mark Block to cross a pit of spikes and leave the basement, the Chomp leaps out of the water, eats the block, and heads into one of the five Warp Pipes visible on the map. The player must use the Star blocks that appear to damage the Chomp four times. However, on the final attempt, Chomps fill up all the pipes. The player can tell the correct Chomp apart from the others by looking at which one is barking the fastest. When it is defeated, the Chomp is destroyed and the block heads back to its original position. A Chomp in Super Mario Galaxy. Chomps appear in Super Mario Galaxy and roll straight off the planetoid, without trying to hurt Mario or Luigi in a similar way as Piranhabons from Super Mario Sunshine. If Mario or Luigi is to step in front of the Chomp, he will be knocked over and hurt. In the Single Player Mode, Chomps can only be defeated with the use of a Rainbow Star, a rubbery bulb, or a Bob-omb. In the Cooperation mode, one player can hold one Chomp's back still while the other player spins it in the front, or one player makes one Chomp stunned while the other collides with it, which will make them explode into many Star Bits. A new variety of Chomp, known as Mini Wanwan, come out of doghouses and are found only in the Dreadnought Galaxy. A Golden Chomp also appears in the Gusty Garden Galaxy; defeating it gives Mario a Power Star. A Rainbow Star can be found nearby. In Super Mario Galaxy 2, Chomps reappear, first in the Flip-Swap Galaxy as the common obstacle there. They later reappear in the Chompworks Galaxy, where they make their most prominent appearance, the galaxy being focused on them. Chomps behave the same way as they did in Super Mario Galaxy. Two varieties from Super Mario Galaxy return: a Golden Chomp, as part of a mission, and Mini Wanwan. A new variety called the Silver Chomp appears as well. They home on Mario or Luigi, and appear in the Rolling Masterpiece Galaxy, the Slipsand Galaxy, and the Battle Belt Galaxy. On the Chomp Saucer planet in the Good Egg Galaxy, one of the holes that the Chomps come out of is much smaller than the rest. However, the Chomps coming out of this hole are still too large to be Mini Wanwan, and bark the same way that normal Chomps do, as opposed to a Mini Wanwan's distinctive bark, despite being smaller than normal Chomps. This page was last edited on April 8, 2019, at 08:42.